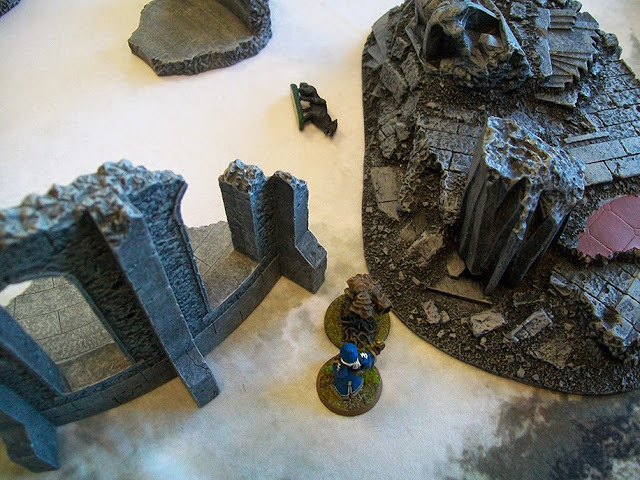 Having just created Sancrief and his warband, I wanted to give him a try out, so I arranged a quick lunch-time game with Phil. We only had a small table to play on, but it gave us a nearly 3' x 3' board. 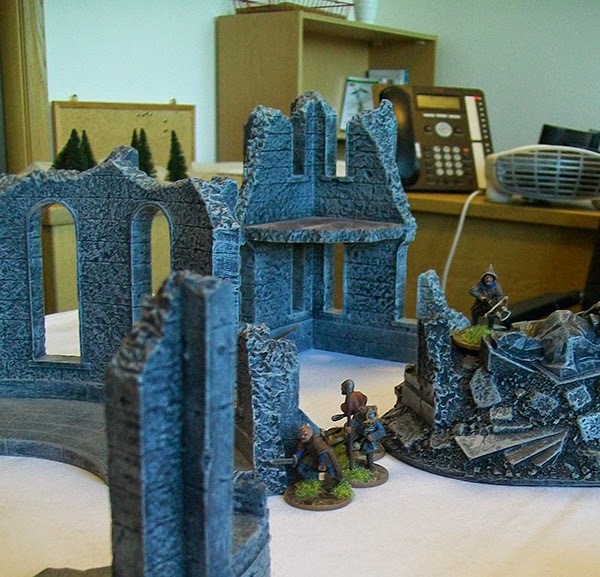 Frostgrave can basically be played on any size table. Smaller boards mean quicker, more violent games. 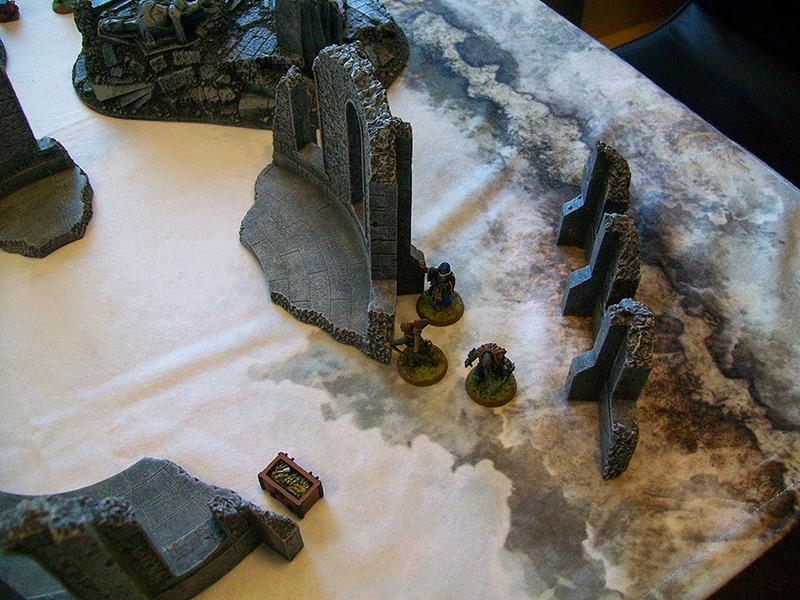 Larger tables give more time for manoeuvre and spell casting. 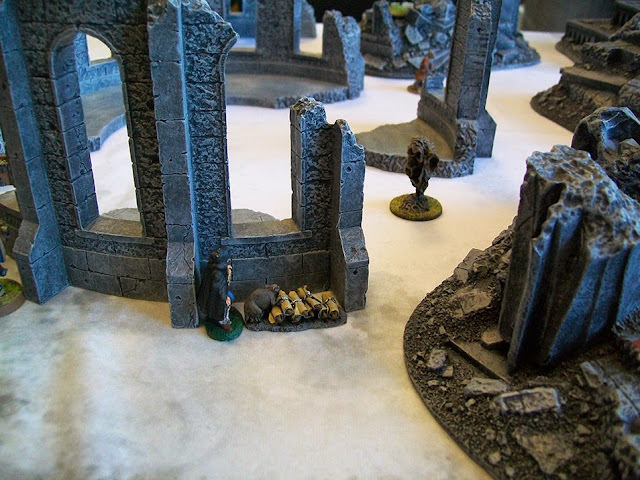 Before the game officially started, Sancrief attempted to roll for an Illusionary Soldier. The spell has a base casting number of 12, and because it is from an aligned school, it is two harder for him. So, he needed a 14 on a d20. As it is an Out-of-Game spell, he gets one shot to roll for it before the game. He rolled a 6, so no illusionary support this time. 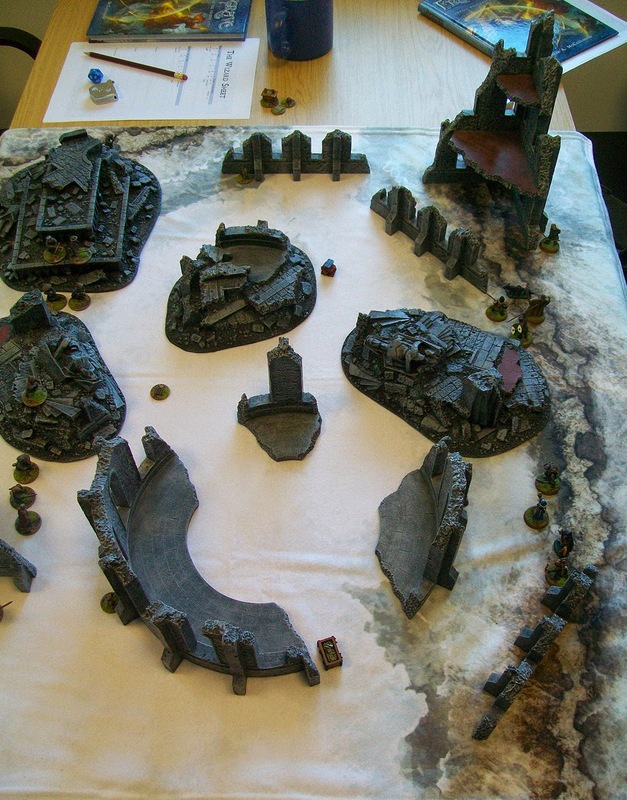 The board was set up for a standard game. Phil and I took turns placing six treasures on the board, then we diced for who would start on which side of the table. During set up, I divided my team into three groups. 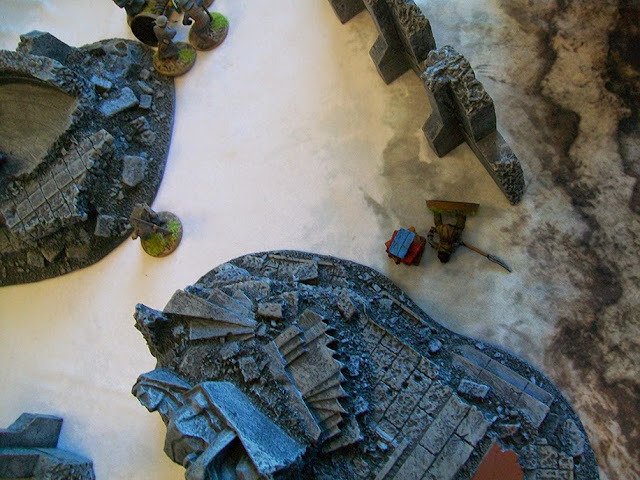 Sancrief, the knight, the warhound, and a thug, would advance up the centre right. His apprentice Vorana, along with the tracker, the thief, and another thug would move up the left. Finally, the lone archer would climb the tall ruins in the corner to get a good field of fire. Sancrief and his men spy a pile of ancient books frozen into the ground and make a run for them. The game began quietly. We rolled for initiative, which I won. I began by moving my wizard and the three men near him. Sancrief attempted to cast a Shield spell, but failed. Lo Shen, that dastardly wizard, also advanced with his men. He cast a Summon Demon spell, and with a puff of brimstone, an imp appeared in the form of a floating ragman. After both of our wizards had moved, it was time for the apprentices to go. Vorana left the thief to collect a pile of scrolls while she took the rest of the men towards a treasure chest. She also attempted to cast a Shield spell and failed (foreshadowing?). Phil's apprentice then activated. He lead his men creeping around the ruins hoping to ambush Sancrief. His crossbowman drew first blood, taking a shot at the knight. The crossbowman has a basic Shoot of +2. So he rolls a d20 and adds 2. In this case he rolled a 12 for a total of 14. In defence, the knight rolls and adds his fight of +4. He rolled a 3 for a total of 7. Since the crossbowman beat the knight's score, he got a hit. However, his total roll of 14 was only one higher than the knights armour of 13, so he did only a single point of damage. Taking the knight from 12 to 11 health. With the apprentices done, all of the remaining soldiers moved. My archer climbed up to his perch, a few of Phil's guys advanced around the edges, and the imp charged straight across the field towards thief. Phil won the initiative on the second turn, which turned out to be bad news for me. My archer, up in the ruins, suddenly realized that if he could see everybody, they could also see him. Lo Shen cast a bone dart spell (this actually requires two rolls, one to cast the spell, and if that works, he makes a shooting attack at +5). The bone dart found its mark, doing 8 points of damage, taking the archer down to 2 health. He did haven't to worry long about the wound, however, as a second later, a crossbow bolt slammed into him, sending him tumbling to his doom. Loosing the archer was tough, but I wasn't worried. As the turn passed over to my wizard, Sancrief cast a Mind Control spell and took command of one of Phil's crossbowmen. Feel confident, Sancrief then sent his warhound scampering across the board to intercept the imp charging down his thief. As it turned out, this would be a major tactical blunder. As the turn passed to Phil's apprentice, he cast a Leap spell* on the mind controlled crossbowman, which sent him hurtling over some terrain and temporarily removed him from the situation. Then he ordered all of his men to rush my wizard. While the knight bravely intercepted one, the other charged through the gap left by the absent warhound and got into combat with Sancrief. Normally, a wizard should be able to take on a thug, but the dice were on Phil's side and Sancrief was beat down. Things were a little better on the other flank. My apprentice cast Telekinesis (she actually failed the roll by two, but 'empowered' the spell by spending two of her own health to make the spell succeed). With this spell, she floated the treasure chest into the waiting arms of a thug. Then she turned around to help the thief in case the imp got passed the warhound. Having lost my wizard and apprentice, the rest of my gang decided to make a run for it with whatever treasure they could manage. Vorana's sacrifice had at least allowed the thief to escape with one treasure. The thug, who had the treasure chest, was gunned down by another crossbow bolt, while my tracker exchanged ineffectual bow shots with an enemy ranger. I got a little smile when Lo Shen tried to cast a bone dart at the tracker, but failed so badly that he actually did a point of damage to himself). The knight couldn't run. 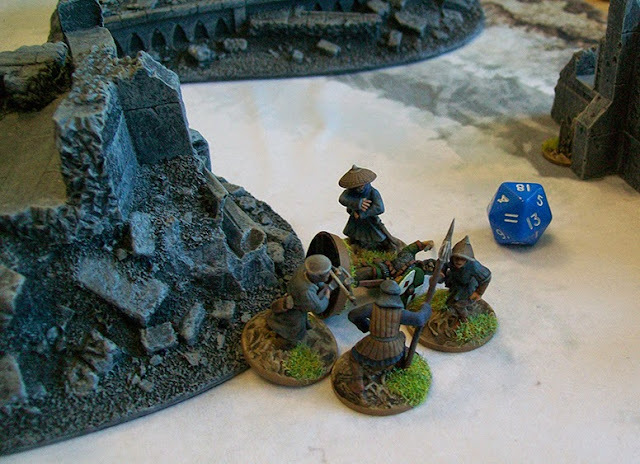 He was pinned down by the apprentice, a crossbowman and a couple of thugs. He fought valiantly for a couple of turns, killing one and wounding another, but in the end, sheer weight of numbers dragged him down. 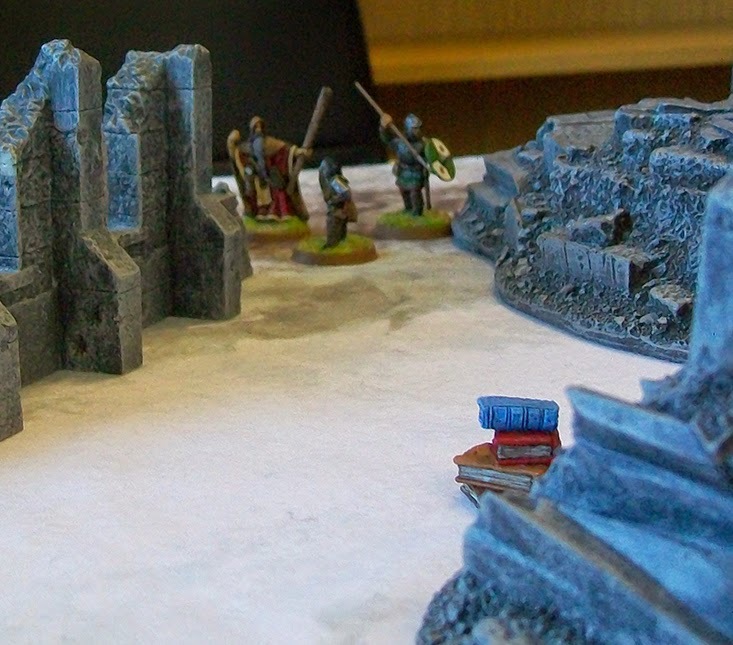 Meanwhile, my thug who was attempting to escape with the pile of books, was gunned down by a Bone Dart from Lo Shen. My only minor victory came when my tracker managed to get off the board with the treasure chest, just before the blood-crazed imp could catch him. So, all and all, a pretty terrible start to the adventuring career of Sancrief. 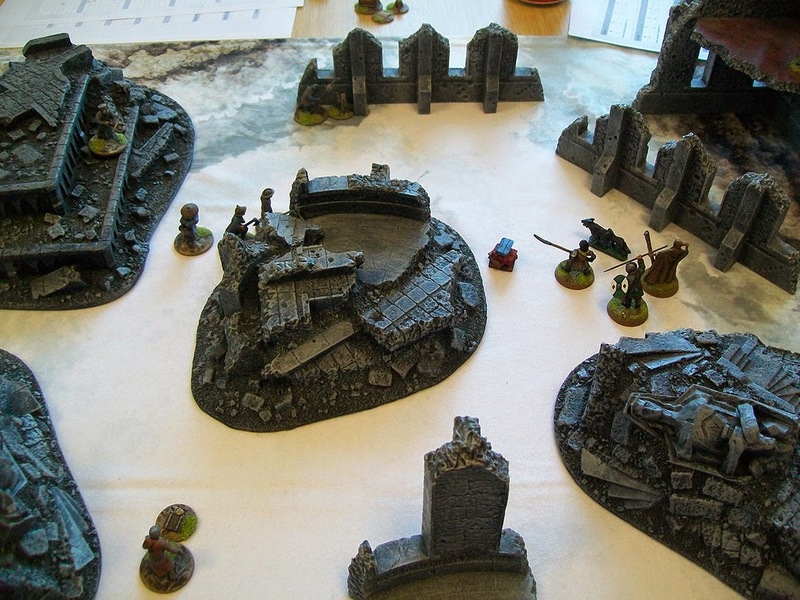 His warband did make it off with a pair of treasures, but those were the only two figures who made it off the board! On the other side, only a single casualty had been inflicted, the thug taken down by the knight. In the post game, I rolled for each of the casualties. Thankfully, Sancrief and Vorana both escaped with only minor wounds. In worse news, the knight was badly wounded and would have to miss the next game, while the two thugs were dead (the former actually hurts worse than the latter). Sancrief picked up 120 Experience (20 for casting spells, 100 for the two treasures recovered), so he gained one level and had 20 experience left over. He used the level to increase his Fight score by 1, so hopefully he'll hold his own a little better next time. When they finally got a chance to look at their loot, the surviving members of the warband discovered that they had found 70gc, three magic scrolls, and a magic dagger that does plus one damage. The gold will replace the thugs with a little left over. The dagger was given to the thief as that's his weapon of choice. The three scrolls turned out to contain the spells: Curse, Raise Zombie, and Banish. 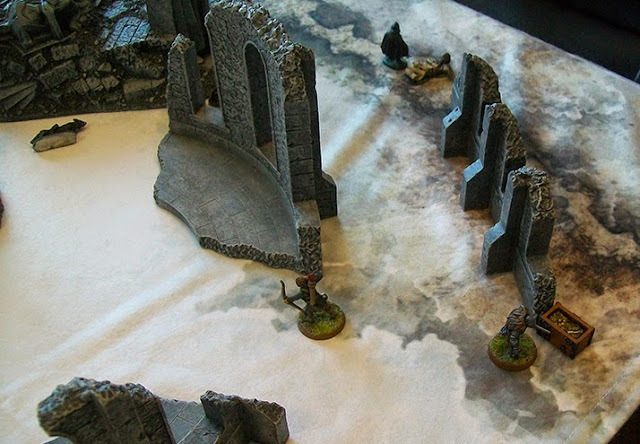 * We later realized we played the Leap spell wrong as the player controlling the model (me) should have decided where he moved and not the casting wizard. He should have used a spell like Push or Transpose to achieve a similar effect. Still, it made for a great moment in the game, so no regrets. 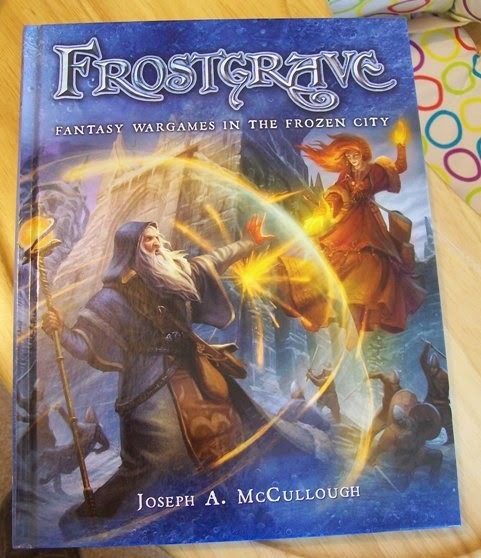 So with the launch of the Frostgrave Nickstarter and the receipt of my own copy of the book, I have been inspired to create a new wizard and chart his journey in the ruins of the Frozen City. Sancrief is the last member of the Brothers of the Rose, an ancient order of Thamaturges. I decided go with a Thamaturge because I believe they are the most difficult type of wizard to play. 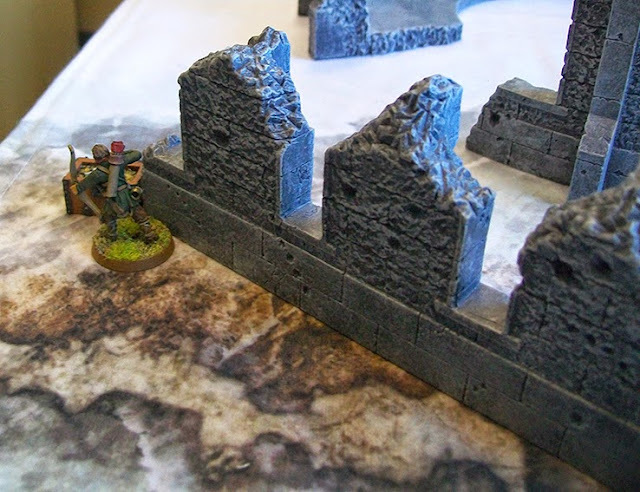 Most of their spells are defensive, which can be really useful, but it's tough to win a game of Frostgrave with defense alone. Still, with the proper handling, I think they can be powerful characters. Since all wizards start the game with the same stat line (although this can change quickly with experience) the main decision the players have to make is what spells to give their wizards. All wizards start with 8 spells. Three of those spells must come from their own school of magic. So, looking over the Thamaturge spells, I started by taking the school's only offensive spell - Blinding Light. While this spell can't actual hurt or kill anyone, it can render them ineffective and vulnerable at least for a time. I then took Shield because wizards are a little short in the armour department. Finally, I selected Dispell, because it is just fun to irritate other players by cancelling out their spells. With my Thamaturge spells chosen, I then needed to pick one spell from each of the aligned schools of magic, in this case Soothsayer, Sigilist, and Illusionist. These spells would be a bit more difficult to cast, but only -2 on a d20. From the Soothsayer school I took Mindcontrol. I'd need a 14 to cast it, but if it works, I can take control of an enemy soldier. From the Sigilist school I took Explosive Rune, which essentially lets me place landmines on the board. From the Illusionist school, I selected Illusionary Soldier. 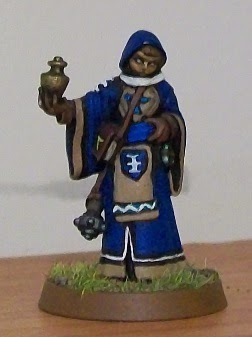 This spell is actually cast before the game, and if successful, I get to add a 'sort of' soldier to my warband. My last two spells had to come from any of the five schools of magic that are neutral to Thamaturges. I'd be at -4 on these, so it was better to look for ones that are generally easy to cast. So, I took Fog from the Witch school, which is good for blocking line of sight and Telekinesis from the Enchanter school, which allows me to move treasure about. So, with my 8 spells selected, my only other decision for Sancrief is what kind of weapon to arm him with. A wizard can have either a staff or a hand weapon for free, anything else he has to buy with his starting gold. Since my miniature is equipped with a staff, I decided to stay with that. 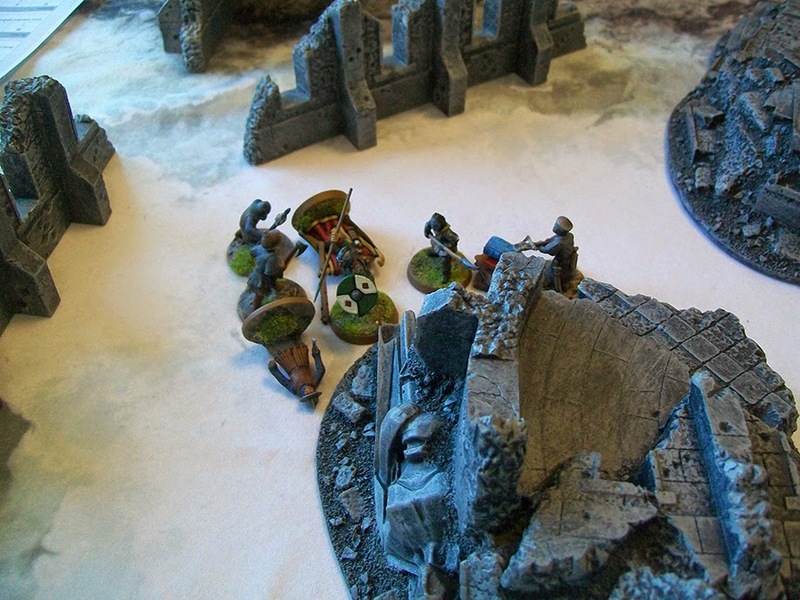 With Sancrief ready to roll, he needed to round up a warband to accompany him into the ruins. So, using his 500gc, he started by hiring Vorana as his apprentice for 200gc. An apprentice knows all of the same spells as her wizard, but has a tougher time casting them. They can be equipped with any weapon in the same way as the wizard. The miniature has a mace, so I decided to go with the free hand weapon. For the rest of his warband, Sancrief hired a Knight (100gc) a tracker (80gc) an Archer (50gc) two Thugs (20gc each) a Thief (20gc) and warhound (10gc). These give him 7 soldiers (one short of the maximum), but uses up all of his starting gold. Sancrief is ready to enter the ruins! (Hopefully I'll have a report of his first adventure up in the next day or so). The figures for Sancrief and Vorana are both from Reaper Miniatures. The warband will be made up of figures from a variety of manufacturers...I'm kind of holding out for the new plastics! It was a cold and threatening Tuesday night as my Oxford Knights softball team took the field for its first game of the new season. After playing in only one game last season due to the birth of my daughter, I had been greatly looking forward to it. After retiring the Globetrotters in order in the top of the first, the Knights got off to a good start with the bats, scoring 5 runs. I contributed to the volley, lining a double into the right field gap that knocked home a pair of runs. We added another 5 runs in the second inning and the game was never really close after that. I had a great night at the plate, going 3 for 5 with a double, two singles, a walk, and a career high 6 RBI! I had a mixed night in the field. I started the game at third base, where I did nothing to help the team. I've never been completely comfortable at 3rd; I just don't think my reaction speed is quite up to handling the hot corner. For the second half of the game, I moved over to second base, where I'm a lot more comfortable. There, I made a couple of sliding stops, including one where I managed to tag the bag while on the ground to get the force out. Much fun. Less fun was the weather. The game was halted briefly in the second inning when the light rain sudden became heavy hail, that stung the skin when it hit. Of course, since the nearest cover was about 200 yards away, there really wasn't much that could be done. It only lasted for five minutes, though the rain would continue to visit in short bursts throughout the night. It never halted the game again, but it made the grass and the balls slick and numbed the finger tips. So, a great start to the season. I'll miss next week's game, but hopefully there will be plenty more. I'm hurting this morning, with achy muscles and a slightly bruised and swollen left hand the cause of which I can't remember. Look What I Have Got!!! It's a book! It's not a word file on my desktop, not a PDF of the layouts, not a print out in a binder. Frostgrave is a real book! I just received the first of my 'author' copies from the publisher's advances. The rest will come when the main shipment lands in late June/early July. A year ago, when I was typing away, I never really envisioned that the book would ever be this beautiful. Since then, so many talented people have gotten involved: Phil, the editor; Stewart, who did the layout and design; Dmitry Burmak, who contributed all of the artwork; Nick who led the figure production; all of the different sculptors who made figures; Kev who painted those figures and took all of the photographs...the list goes on. Today, I am a very proud and very happy author! With my wife and daughter away for a couple of days, I managed my first long painting session in quite a while. So, with my headphones on, and a Doctor Who audio adventure in the portable CD player, I tackled the centaur. I decided early on, that since this was the first centaur, I'd go with a very basic paint job. There is lots of potential for painting detail on a horse, but I didn't take any of them. I went with just a few layers of brown, a sort of blondish tail, and left it at that. 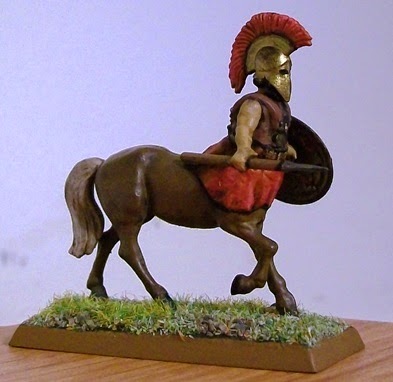 My big worry when painting this guy is that the tunic skirt that I used to cover the gap between the horse half and the human half would look silly. In fact, once painted, I think it looks pretty natural. There's a little lump at the back, but otherwise, I think it works out well. I went with red to match the helmet crest and because it will be the unifying colour for most of the army. 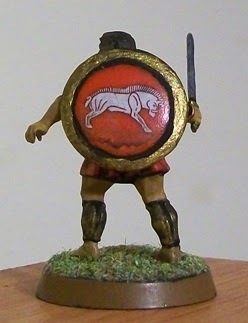 Having painted the centaur, I thought I would increase his level of detail by giving him a complex, gorgon design on his shield. I slightly regret this move as I think the shield slightly overpowers the rest of the miniature. Still, it's a minor point, and once this guy is riding in a unit, I don't think it will really matter. All-and-all, I'm really happy with how this guy turned out. I'm looking forward to converting a few more for the army. For a long time I wasn't a fan of gorgon shields and avoided using them on my miniatures. Most of them just looked a little too much like a clown face, and I couldn't really understand the connection between those faces and the mythological, snake-headed creatures, of which Medusa is the best known example. Then, a couple of months ago, I was flipping through a copy of Ancient Warfare Magazine and came across a short article on the history of the gorgon as an armour decoration. This gave me a nice introduction to how the image of the gorgon evolved overtime from the clown faces to the snake headed monstrosity. One point made by the author really struck me. He pointed out that the human gaze is drawn to faces and especially eyes, so having a face painted on a shield might actually give someone a slight combat advantage by distracting his opponent. 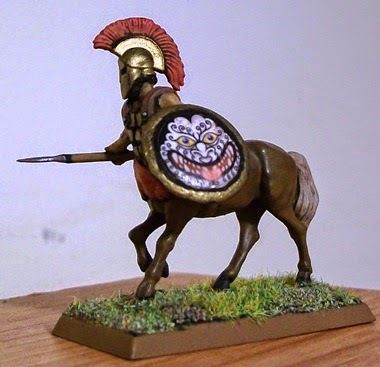 So, since reading that article, I've had a bit more respect for the clown-faced gorgon! While historical ancient warfare isn't really my period, I do heartily recommend Ancient Warfare Magazine. It combines readable articles with some really great artwork. 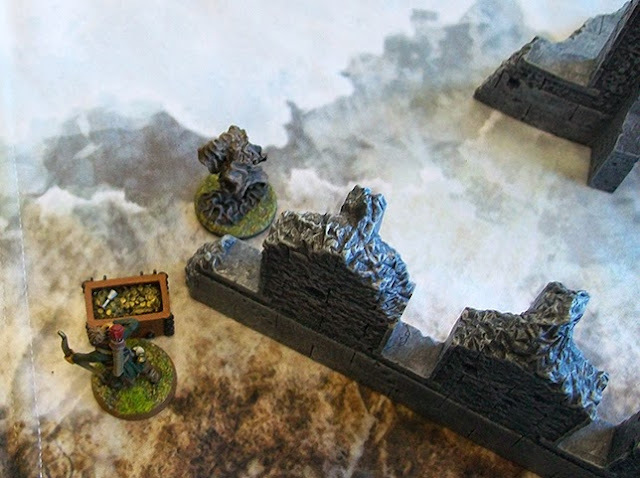 The Frostgrave Nickstater is Up and Running! So here it is, your first chance to pre-order the Frostgrave book along with the miniatures! 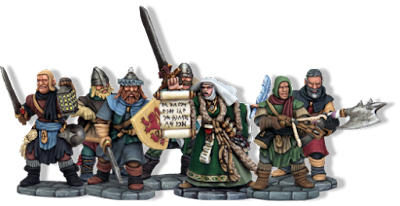 Nick over at North Star Miniatures (who are co-producing the Frostgrave miniatures with Osprey Games) have set up a 'Nickstater' pre-order program. There are five different pre-order levels available, which should cater to just about everyone's interest level. For those who just want to have a look, you can pick up the book and get six free resin treasure tokens for just £15! I know I am a rather biased observer, but seriously, is that not the best deal currently going in wargaming? Probably the most popular choice will be level 3. 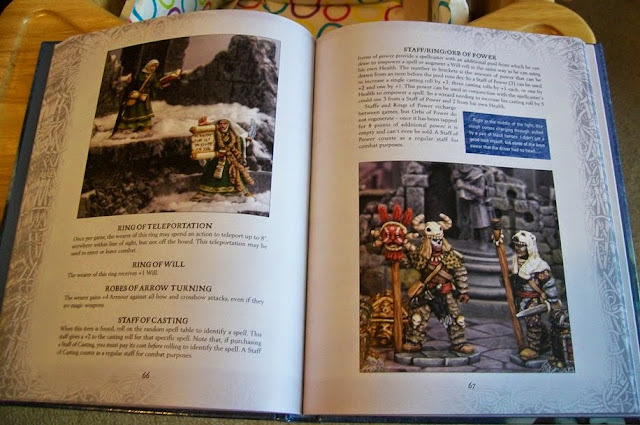 At this level you get the book, the treasure tokens, a wizard and apprentice pack of your choice and a box of 20 plastic soldier figures for £40. Not only that, but you will be eligible for certain bonuses if the Nickstater hits certain success levels. In fact, it has already hit the first one, meaning everyone who has ordered a level 3 or higher package is getting a free metal treasure chest miniature! Anyway, you can check out the whole Nickstater page here. 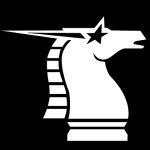 Those in the US can order a Nickstarter package through Brigade Games. It's really amazing and wonderful to see people getting really excited and interested in something I created. Since my last post, I had a bit of a painting-breakdown. 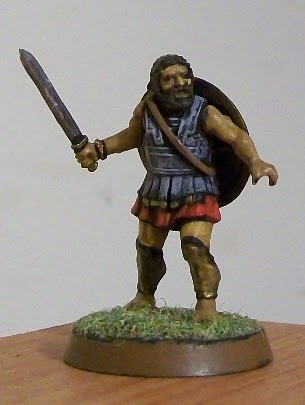 I was working on a second Numidian and my first Hoplite and neither seemed to be working. The more I tried to make them work, the more frustrated I grew, until I almost ruined my evening and nearly decided to throw the whole project in the bin. Of course, I was over-reacting. This is supposed to be a fun hobby, a way to relax. Anyway, heeding some good advice, I put the project aside, and spent the next couple of days devoting my hobby time to clipping sprues (amazing how little space a 'box of miniatures' takes up when you clip all the parts off the sprues). 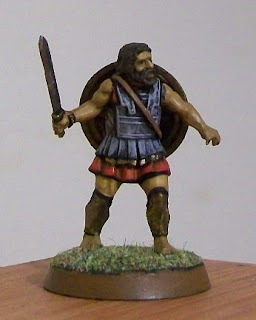 I returned to my Greek Myth army yesterday, and picked up my brush with renewed enthusiasm. I finished off the second Numidian. I had been struggling with his shield design, so I ended up giving him the same design as the first one. It made life easier and gives them a nice unified look. 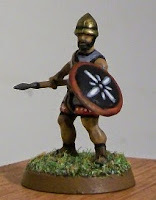 I also finished the first of my heroic hoplites. Originally, I had intended to give my hoplites black armour, like Jason and the Argonauts in the classic film, but I just couldn't get it to look good. So, instead, I painted grey over the black and I'm very happy with the results. 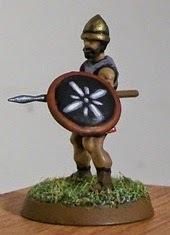 I had also been struggling with how to position the shield on the hoplite's arm. I couldn't find a position that looked natural, so I stuck it on his back instead. Obviously, he's been caught of guard, and only had time to draw his sword. Okay, that doesn't make much sense in the context of a pitched battle, but hey, the figure looks good, so who cares. I'm really pleased with how well the Gripping Beast head looks on the Wargames Factory body. Despite the break in my painting, I carried on with my reading, finishing books 4 through 8 of the Odyssey. In book 4, we finally meet Odysseus for the first time, trapped on the island of Calypso. When he finally gets permission to leave, he quickly builds a raft. Well, I say quickly, it takes him four days, but that seems pretty quick to me. If I were trapped on an island, I could probably spend years attempting to build a raft before I got anything seaworthy. Odysseus, however, is not only a hero, but he also comes from a small island nation, so I suppose he probably knew a thing or two about ship building (then again, he was king, one wonders how much hands-on ship-building he did). The raft lasted 18 days at sea, unfortunately the gods decreed it would take him 20 to reach land. After two days in the water, he eventually washes up on a friendly shore. The next three books are all about the greeting he receives, the meals that are eaten, the songs that are sung, and the games that are played. Interesting stuff, but it might drag a bit in a modern movie version. Next book, it appears that Odysseus will final start talking about his epic journey from the victory at Troy. While I'm sure it has been remarked upon many times before, it is very interesting how the tale of the Odyssey is crafted. It actually starts very near the end of the story, with Odysseus almost home, and the problem of the suitors reaching a crisis in his house. It then goes back and tells of the adventures leading up to this point. Normally, I'd say this is a very modern style of narrative, but obviously it's not. 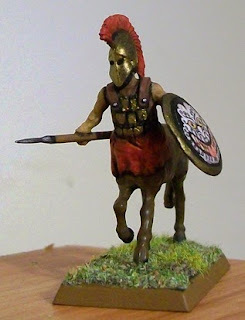 Anyway, next time I hope to have my first painted Centaur to show off. I decided to start painting my Greek Myth army with a Light Infantrymen, because I knew they would be the least fun. Unfortunately, I have to report that painting these figures only confirmed my thoughts about these figures. They really are dreadful. Probably the worst 28mm figures I have ever painted. They have very little detail, and what detail they do have is so shallow that it makes it hard to pick out. As a miniature painter, I pretty much rely on detail. My style is all about picking out details and then black-lining around them to achieve an overall effect. When there is no detail, my style doesn't work. Instead, out of necessity, I switch to an almost impressionistic style, that mostly consists of wet blending - painting different layers of high-lighting over wet paint. At a couple of points while painting the figure, I honestly thought I would have to give up and throw it away. I just couldn't get it to look like anything. In order to get some kind of detail, I added the red and white trim to his tunic, which I think helps a lot. Originally, I had intended to give these guys plain bronze shields as I didn't have any transfers for their size, and I figured they should look more uniform anyway. However, seeing the figure, I realized it needed any help I could give it. On Saturday, I traveled down to London. While my wife and daughter went off to meet the in-laws at the aquarium, I went to the British Museum to spend some time in their Ancient Greece collection. The British Museum really is one of the great museums of the world, and their Ancient Greece section is pretty extensive. I spent a couple of hours wandering around, snapping photos and reading captions. Most of that time, I was amongst the red and black vases. Over the last four or five years, I have become a big fan of this art form. Not only do I find it attractive, but it contains so many wonderful, visual representations of Greek Myth and warfare that I find fascinating. 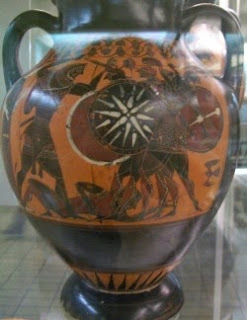 On this trip, I was especially focusing on the shield decorations of warriors on the vases. Most of the ones I saw are reflected in the transfers I bought from Little Big Man Studio; however, one design, that I actually saw a couple of times, was new to me. It was a kind of star pattern. I saw it on one vase on a shield carried by a warrior fighting Herakles and on another on a shield carried by Athena. I decided to simplify it quite a bit on the shield for my Light Infantryman, but I think it looks pretty good. In the last week or so, I've gotten several emails from people who want to start work on their Frostgrave warband before the game is actually released. Well, that is certainly gratifying, and I only hope that the rules live up to their expectations. While I hope everyone understands that there is only so much I can say about the game before it is published, I do want to help people as much as possible. 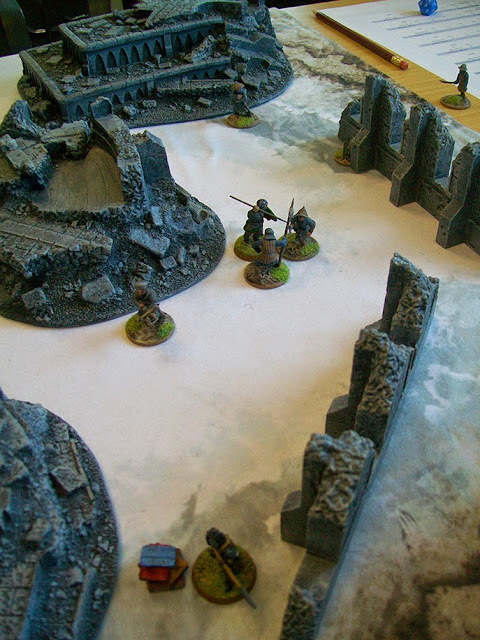 So, here are some rough guidelines for building a Frostgrave warband. Wizard: Every warband is led by a wizard. He is the most important, dangerous, and valuable member of the warband. He is basically the player on the tabletop. The wizard has 500gc to spend on assembling the rest of his team. Apprentice: A starting apprentice costs 200gc. While a wizard doesn't have to have an apprentice, I can't imagine anyone not taking one. It is the only way to get a second spellcaster in the warband, and also allows for more tactical flexibility during the game. Soldiers: This is a catch-all term for the living, non-magical mercenaries that can be hired by a wizard. I haven't given their stats (which wouldn't mean much without the rules anyway), but I have listed the different options, the cost, and the equipment of each one. 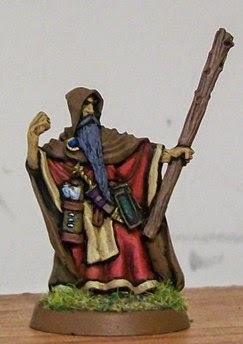 A wizard can have up to 8 of these in his warband, and I would suggest that any beginning wizard will want at least 6 (I'd go with the full 8, personally). While the cost gives an idea of the relative value of different soldier types, it is worth noting that price goes up exponentially with quality. A Knight is definitely not worth 5 Thugs. I would not suggest that any starting warband have more than one soldier worth 100gc. You can always upgrade later. A wizard can hire as many of any type of soldier (up to the maximum 8) that he wants and can afford. 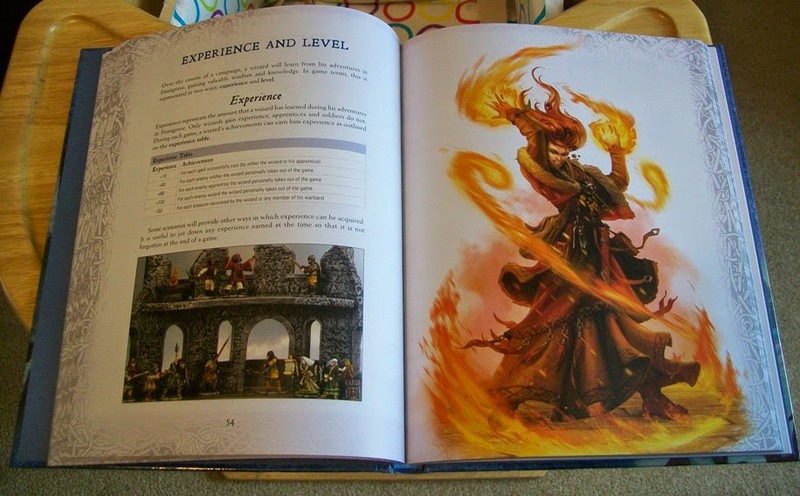 Creatures: Additionally, some wizards will be able to use spells to get a creature or two to join the warband. Some of these will take the place of a soldier, some will be in addition to the normal warband limit. The most common of these are zombies, demons, animated constructs, and animals (wolfs, bears, leopards). 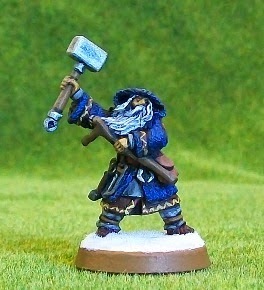 In other news, the rumours going around say that the Frostgrave Nickstarter will be starting up this week sometime! I will, of course, let everyone know! Last night, I managed the boring and not really visually-appealing task of preparing the bases on my first five Greek Myth figures. This involves using bits of label to cover up any exposed parts of the slot and then plastering over the base to give it a more level surface. In more exciting news, my shield transfers arrived! I used to hate decals. When I was younger, I used to make plastic military models and the water-slide transfers that come with many models caused me no end of grief. First, they escape in the water and go floating around. Then, when you do catch them and try and put them on, they slide all over the place. When you finally get them where you want them, you always have to touch them one more time to get rid of excess water, and inevitably they either slide out of position, or, even better, tear in half. If by some miracle you do get them on, six months later, they shrivel and peal off. Thus, for many years, I avoided having anything to do with decals in wargaming. Then I discovered Little Bag Man Studios. These are THE guys when it comes to miniature shield decals. 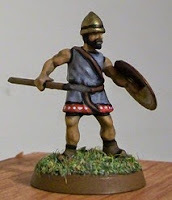 A few years ago, I took a chance and tested them out on some Viking minis. They just looked so good, I had to give them a shot. They are wonderful. Unlike water-slide transfers, these are more like stickers. You cut them out, peal off a thin bit of plastic on top, then place them face down on the shield. When it's attached you just wet the paper that is still attached to the back and the paper lifts right up, leaving your beautiful shield decoration. These little decals can really make a model. So, when I started this new Greek Myth project, I immediately put in an order, and it arrived today. I got three sheets (at £3 a sheet) each has 16 decals. They are technically for Crusader miniatures as they don't make them specifically for Wargames Factory figures, but they are close enough. Two of them are Greek, one is Etruscan, but as long as they look cool, that's good enough for me. 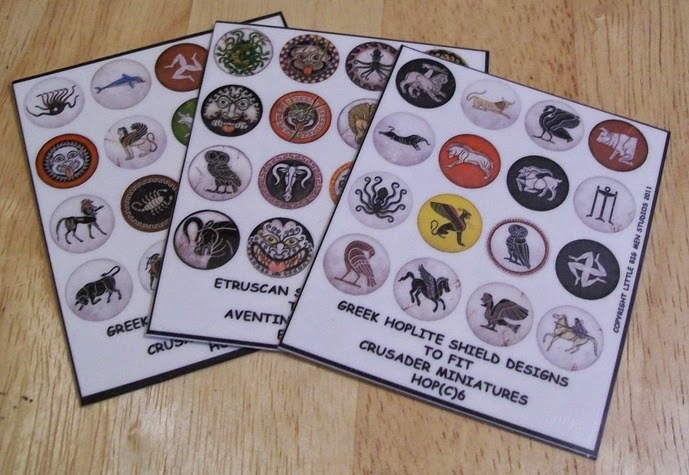 There are lots of really cool images on these, including a lot of mythological creatures: the Hydra, the Chimera, Pegasus, the Kraken...there is even one of the Etruscan ones that appears to have the Batman villain, the Joker, on it! Can't wait to get these suckers on some shields!